SoBe is a drink brand of teas, elixirs, and energy drinks produced and distributed by PepsiCo. SoBe is properly pronounced "so-bee" and stands for "South Beach Beverage Co." However, The South Beach Beverage Company is a drink manufacturer based in Norwalk, Connecticut, and was purchased for $370 million USD by PepsiCo North America in October, 2000. SoBe is marketed as "the world's best tasting naturally flavored beverages" and has a large product lineup, but the main energy drink formulation is SoBe NoFear, which is billed as a Super Energy Supplement. 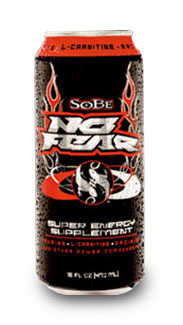 It is the joint effort of SoBe and the "performance masterminds" of the No Fear brand. Claim: "The toughest can on the shelf with twice the Red and none of the Bull!"